Why Do You Need Fish Finder for Fishing? Top 10 Reasons. Fishing is an interesting and exercising activity. It is growing its sector and many tourists come to beaches just to enjoy fishing. It is fun in itself and people enjoy sitting a couple of hours beside the pond with bait dipped into the water. Well, we all know there are several tricks in fishing to improve your fishing skills and have a huge catch. In this modern tech world, you will find a lot of stuff in the local markets related to fishing. Many digital gears and gadgets are available to support the fishermen. Here, the gadget I am going to talk about is the fish finder. An ultimate device which a rookie can use to fish easily and effectively. The question arising in your mind is that what the fish finder is? The sailor or boatmen use the fish finder device to find the fish inside the water, which works on the SONAR system. The working principle is very accurate and sharp. Sometimes, you go to the lake with your friends or family to enjoy fishing. But you don’t know the right place to fish in that vast lake. You don’t need to guess anything. The fish finder will help you to choose the great location and I bet you will enjoy it. There are some shocking advantages of this little device that will surely arouse you get one for you! The fish finder is a compact digital device with a complete guide for fishing in itself. You can have a good catch if you know what is under your boat, and here this smart gadget will help you. Saving your time and making you successful, the fish finder will make you a proud fisher. Let’s find out more about its features. It is very easy and efficient to find fish with the fish finder. It indicates the fish population as small fish like symbols on the screen. The device uses a SONAR system to locate fish. It works very simply. The sound waves are transmitted by the device inside the water which is reflected back to the device. Those reflected waves tell the device the location of fish and it is displayed on the screen. The device can find out if it was fish or anything else like stones, pebbles etc. It will show the symbol of fish on the screen if there is fish under your boat. With this tool, you don’t require to make any guess. The location it indicates will be correct all the times. An experienced fisherman can also be wrong about the fish location, but the fish finder will get you to the tons of it. You don’t need to waste your a lot of time finding a correct location for fish. This device will do that for you. You will never get disappointed coming back home. It is not an easy job for a beginner to find the fish location. A fish finder is a great tool for him, and he will never regret it. If you know there is fish inside the water, you can easily earn a bonus. So, the fish finder is a great tool for fishing. You don’t know how deep our bait is and where is it inside the water. The fish finder helps you to find these small details also. You will have every detail about the bait like the depth of the bait, size, and fish surrounding it etc. Some fish like catfish and bass easily follow the bait. It gets easier to catch them if you are near to them. This device shows the real-time position of the bait. Sometimes, you can’t see the bait from the surface. Your bait is not in the right place where it is supposed to be. Here the fish finder will help you. It will show you the depth where your bait is and, you can easily get close to your target. Fish gets attracted to the bait because of its color and smell. It travels toward the bait and attacks on it. But you submerge the bait to catch that fish. So, the fish gets attracted and trapped in your trap. It is very important to get your bait in the right location and depth. Location of your bait will increase the chances of your success and also, you can focus on your favorable species. You can attract fish to the bait wisely with the timely use at the correct location. Some device comes with a GPS system which provides a detailed view of the location of the bait. GPS will show the real-time data of the bait relating its accurate position. It is one of the best features of the fish finder. You are free to choose a specific species of fish from the water. The government banned several species for fishing purposes. Here you can be dependent on the fish finder. You can differentiate between the bass and the halibut. These will be shown as a structure or flat areas on the screen. These are the important and common groups of fish sold in the market. The fish finder will also indicate the size of fish which really affects the selling price and quality. Also, you can check out the size of fish groups which will generate you additional income. The color coordination feature in the device will help you to go behind a single species you want. You will see different species with a different color on the screen. You can read the depth of fish inside the water which will make it easier to judge the fish species. This feature also saves you by not trapping any unwanted fish like shark, jellyfish etc. You are no longer puzzled and can fish with a pure heart. You are not harming any aquatic animal here and you are not wasting your important time. Catching the off species is one of the major problems for fishermen. The off species are not valuable in the market or they are banned for fishing. So, you have to dump them back into the water before leaving. With the fish finder, you can save your time by catching the desired fish. The temperature of the water differs by the area, and the quantity of fish will also change according to it. Most of the fish are cold-blooded animals. They can regulate their body temperature depending on their surroundings. Fish move in the water depending on the temperature and food. You need to know the temperature of the water for a great success. Especially in the turning seasons from winter to spring, it becomes more important. Some fish enjoys in the cold streams and some like to grow in the warmer temperatures. This will also guide you to choose the right species at the right time. Sometimes, you are at the place where there was a lot of fish but due to a change in water temperature, they have shifted their home. Most of the fish follow the ocean currents and moves from one place to another. It is important for a fisher to know the temperature of the water. Risks in the fishing are reduced if you know the temperature of the place. It will indicate the species and quantity of fish present in the water. Some species live at the colder places but prey at the warmer one. Temperature range of 50 to 75 Fahrenheit is best for many common fish species. You can look at it and uplift your success chances. Different species of fish survive at different temperatures and layers of the sea. Considering the temperature range of the water, you can judge the fish species. The fish finder will display the depth of fish on its screen. If you want to dive off into the water, it is an important option for you. You know the depth of fish and are sure about its presence. You don’t need to jump inside the water on the basis of your ideas. This device will show you the map of the lake or water body under your boat. You will get sure if it is fish or a reef. The depth of fish also indicates the quantity and species of fish. A particular species of fish love a particular depth in the sea as its home. You cannot find fish at the same depth every time. They will differ every time according to some factors like temperature, oxygen content, and food etc. Fish also move as there are a variety of predators who love to eat them. So, fish run here and there for their safety. This feature will help you to get a huge chance for your success with fishing. The bottom structures you might see with your naked eyes may be fish or anything else. You might become a hero or a zero with your timely decision. The fish finder will help you to be accurate about your decision. You can find it out easily if it is fish or a reef or any wrecked ship beneath you. What do we mean by habitat? Habitat is an environment in which any species live or survive. Earth has two third of its surface filled with the water. There are millions of aquatic species surviving in the water. So, Habitat will differ in every species according to their nature. 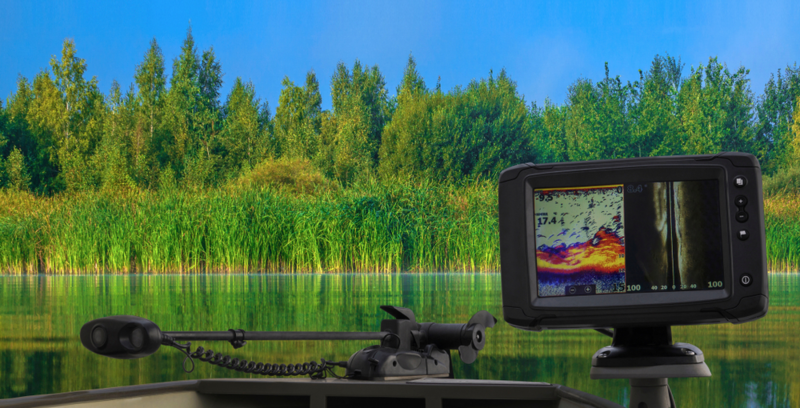 So, what is the big deal here for which you require a fish finder? From a boat, we cannot say what is inside the water. We can never judge the habitat inside the water without diving into it. So, here the fish finder helps you to find the right place for fishing. You can choose a habitat according to the species of fish you want to catch. Every species of fish have its own favorite habitat. Some love to live in the corals and some lives in the open water. It makes you easier and simpler to fish. You don’t require any special skills to fish if you have a fish finder with you. The habitat below will ensure you if there are a lot of fish or not. There are over thousands of aquatic habitats. And they support millions of fish species. You need to know about the habitat of the place where you are going to fish as if it is a lake, river, sea or ocean. The fish finder will make it easier to locate fish. As finding a correct species in the open sea is a very tough job. A beginner cannot find the place in the sea effectively good for fishing easily. There are tons of models of the fish finder present in the supermarkets. The size and complexity of the device vary. You can find a very flexible model for you. It comes with the portable models too. You can easily carry these with you in your bag pack anywhere you want. You can get many features in one box. The fish finder has a color screen and a few buttons. You can watch the data on the screen in hard sunlight easily. All the buttons present on the device are labeled and on the right-hand side. You get a menu button, back button, and four navigating buttons on it. These make it easy to operate for a rookie. The fish finder is designed for all humans. It is very simple in design and can be used by any age group easily. It is made up of tough material and you can use it in abnormal conditions like high temperature and humidity too. The high-quality screen is easy to read and you can adjust its brightness and sharpness according to you. You don’t need to depend on several types of equipment. Only one fish finder will be enough for good fishing. You can fit it in your boat or can keep it in your hands, it is up to you. This sport is growing its boundaries at a great pace. Ice fishing is a little different from fishing as you are standing upon the layer of ice floating on the water. You can’t estimate the location of fish easily in this situation. As it is very difficult to see through the thick layer of ice. The fish finder works very effectively in this situation. It gives the information about the fish crowds under the ice. The fish finder makes it easy to locate the fish and the bait submerged under ice. In this sport, locating fish is very tough as you can’t see down there. The cold temperature leads to less population of fish in these areas. Fish is not evenly distributed all over the seas and oceans. In some areas, you will find a lot of it and in the other, you might have to struggle for one. You need to search very carefully keeping all the parameters in your mind. Then you can succeed in the ice fishing. The frozen water belt stops you to enter the reservoir. So, you need to make a hole in the ice to reach the water. If you know there is fish under there, then making a hole is a good choice. But if you have a guess, then you should get ready for extra exercise. Making holes everywhere in the ice is not possible. You need to be sure if there is fish or not. You can ensure it with the fish finder. This device comes with this integrated feature with which you can check two modes at one time. You can simultaneously watch the temperature and the location of fish at the same time on a single screen. This makes it a compact, portable device and easy to use for beginners. You don’t need an additional screen to monitor different modes at a single time. This device will do that for you. Dual screen feature will provide you with better eyesight on your bait. As if there is harsh sunshine and are not able to peep through the water, you can actually watch under yourself clearly. It will increase the area under you. You don’t need to bend downwards and try to look for fish. You can do the same comfortably sitting in your chair. Also, you can information at every angle in the water. You don’t need to run round and round in your boat. Like you can check both angles at one time and watch what is happening beneath your boat. At the same time, you can also note different parameters like depth, temperature, structure, and location etc. You don’t need to open one window and quit the other one. You got the power to watch both of them. Some fishfinder comes with four screen option where you can check four parameters at once. You don’t need to quit anything. The fish finder is very easy to use. It is very ideal for beginners and for professionals too. This device with help you to learn more and more about fishing. You can polish your skills and you can unlock many new techniques of fishing. Beginners can use this device for everything to find fish. It will become damn easy without waiting a couple of hours in the water. You can save good places where a lot of meat is present. You can learn about the depths of your lake and how the temperature matters in fishing. So, here I am saying it is user-friendly. It means it has a great well-labeled front. You don’t need a lot of guidance to work with the fish finder. It has a great screen to work on. All the buttons are labeled with their functions. It is not too sophisticated as a jet plane. You will find a few buttons on it to go on. The fish finder is made of a hard and water-proof material. It does not have any high working costs. The handheld device can be used at any time. The best part is that you can find fish easily without much attention. You need one fish finder on your boat and you are done. No need to guess, no need to get bored. You will enjoy a big catch every time with the fish finder. These are some reasons for which you should buy a fish finder for fishing. You get a lot of knowledge and skills about fishing with this gear. If you are a newcomer, you don’t need to panic. The fish finder will help you to become an expert in fishing. Being a professional, you can easily find fish spots without losing your time in an efficient way. You can use it anywhere in your boat or while you are sitting on the shore and don’t require to stick to one place for several hours to catch fish. At the same time, you can ensure if there is fish in the water or not also check all the parameters required in professional fishing. It is as simple as a kid’s game and you will enjoy fishing from a new angle. It is a next-generation technology for fishing. A fusion of the technology and experience will rise you as a successful fisherman. I believe you will be very happy after a successful catch with this gadget. It is very easy and fun to use in addition to the gadget does not need any professional training to operate. I think you have all the key points about the fish finder in your mind now. Now, I suggest you check out the best-suited model of the fish finder for yourself. Thanks for reading.